Best Seller Publishing announces the release of Kurt Hegetschweiler’s new book, “Million Dollar Builder : Discover the Road Map for Optimizing Your Profit, Work-Flow and Cash-Flow and Achieving a Seven Figure Net Profit in 3 Years or Less.” It will be available for free download in the Amazon Kindle Store on September 10th. 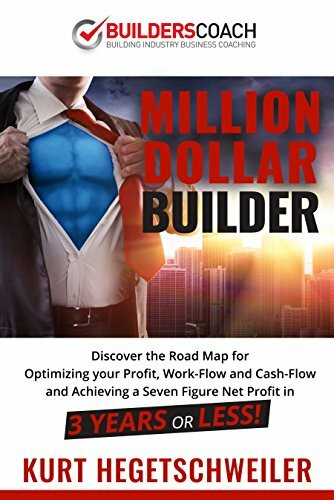 “Million Dollar Builder” by Kurt Hegetschweiler will be free and available for download on Amazon for 5 days (09/10/2018 – 09/14/2018) at: https://www.amazon.com/dp/B07G3JMB4M. “After working with Kurt more than 12 months now, my building business is unrecognizable, by applying the strategies in this book we have a clear direction and understanding of where we want to go. Although Kurt has outlined these principles in the coaching sessions it is nice to have a resource where everything is in one place!” – Marty T.
“Any builder who has aspirations to grow or keep their business successful must read this book. A huge thank you to Kurt who, through this book alone, has helped me make my building business that much better!”– Robert Younan. As the founder of Builders Coach, Kurt Hegetschweiler has officially become recognized as the building industries “Millionaire Maker” having achieved a seven figure Net profit result with multiple builders, some as young as 29 . Since 2004 Kurt has helped 100’s of builders structure their businesses for optimum profit, work-flow and cash-flow. Kurt prides himself in delivering less information and more results, using industry specific, real life, hands on, no fluff business strategies that work.